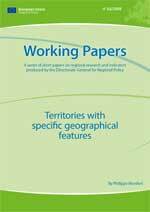 The objective of this paper is to provide an updated analysis of the economic and social situation of the territories with specific geographical features and their evolution in recent years in order to identify possible systematic trends that characterise various types of territories. In particular, the paper highlights the performance of such territories compared to other EU regions. It also analyses how such performance varies within one particular type of territory from one region to the other. opportunities of specific types of regions.